BAD-2013-67&#x2F;365 & EMPR & BAW 11&#x2F;52, a photo by markasky on Flickr. It is another unconventional challenge and they used Duck Tape to create a prom dress look and it needs to be fashion forward. They will take their looks to a high school and students will judge it that night and their score counts for 20% of their final score. 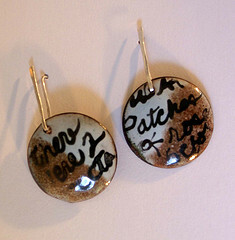 Translation: What can I say, make a piece of jewelry using duct tape; just duct tape or combine it with other materials. OMG, I have found my new favorite material! And I am such a pyromaniac, I just had to burn it! 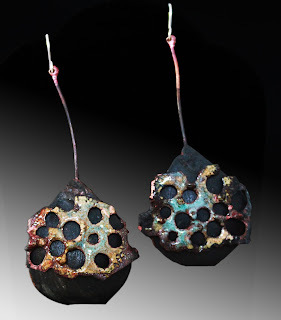 Copper mesh, duct tape, alcohol inks. And gee, what better way to put a pin back on than to duck tape it!!!! BAD 2013 61/365, a photo by markasky on Flickr. 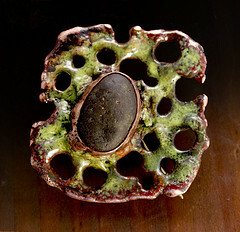 Brooch # 61 of 365. 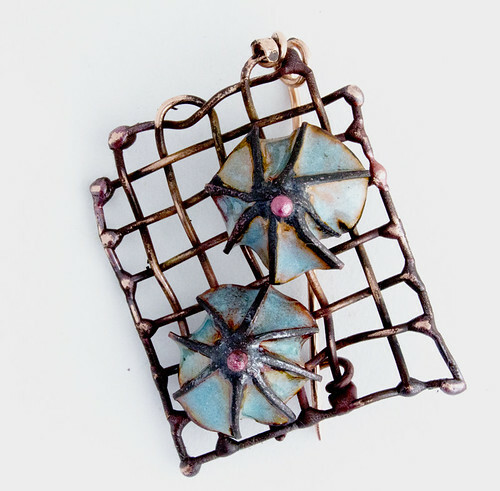 Mesh fused on to burned copper with fossilized sand dollar setting. BAD 2013 #60/365, a photo by markasky on Flickr. 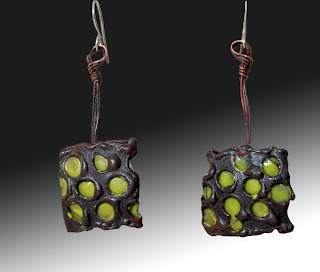 Check out my how-to article on making earrings from the series "Scars Make Your Body More Interesting" in the spring Belle Armoire Jewelry issue! 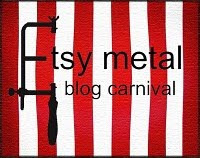 Etsy Metal Blog Carnival - Photo Tips! What are your photography secrets?! Any tips, tricks, what works best for you, what doesn't? How often do you photograph your work? Do you have an expensive set-up or a homemade one. Your best piece of advice for photographing jewelry. Show us some of your best photos. 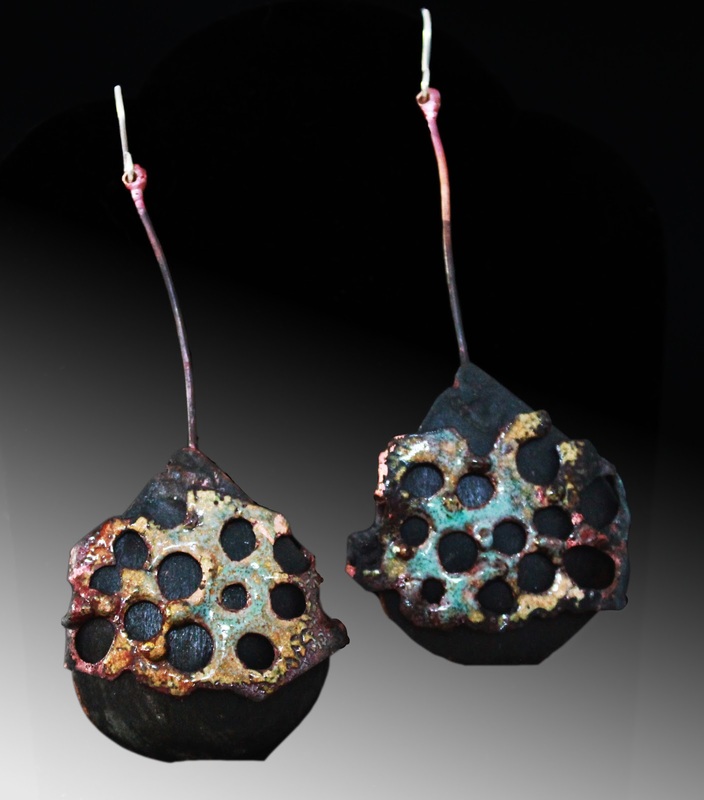 I'm a metal smith. I make jewelry and small sculptural pieces. I'm not a photographer. But I need to take pictures of my work and it's expensive to have to keep paying someone else to do it and I'm not usually happy with the results. 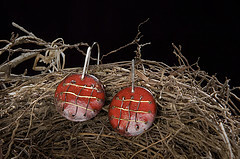 So out of necessity, I've had to learn to photograph my work. It's been a long process (and I'm not done yet!) I did take a couple of photography classes in college, but that was a long time ago in the days of actually putting film in your camera. I looked at a lot of other people's photos, asked how they did it. Lighting is really important and shooting in daylight can be really good. Indirect lighting. Read books, read blogs, experimented - a lot. Doing Ring-A-Day was really helpful. I know that if you keep doing something every day, you start to figure things out and get better at it. I had to take at least 1 picture a day, and that really helped step up the game. It's really about paying attention to the details before you take the picture. Where's the reflection, is there too much glare, is there dirt on background, what's in focus - what's not. I shoot in RAW format. I like that because I can adjust the white balance in the RAW program instead of my camera. That way I don't have to remember where the AWB button is or spend an hour looking for it in the manual. And I can save the photo as a big file and refer back to it if I need the picture in different formats. 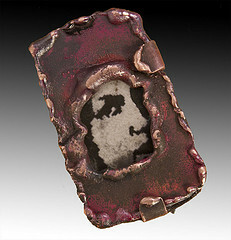 For when I need a quick photo... like for Brooch A Day... 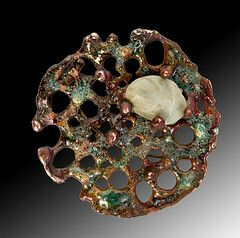 I shoot my brooches mostly on a piece of frosted white plexiglas to get a good contrast of the image so I can add a gradient background in PhotoShop. 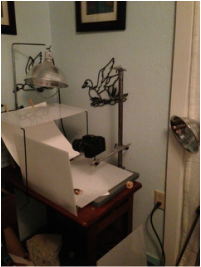 I also use frosted white plexiglas as a filter on the 2 side lights and top light. 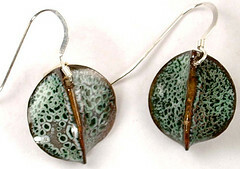 It's hard with jewelry, because what works well with one piece doesn't necessarily work well with others. I use PhotoShop to add backgrounds, adjust the exposure, contrast and clean up any dirt and dust. The one thing I'd really like to learn is to do gradients using lighting and the camera... my brain can't seem to get a grip on that yet! BAD-2013 30/365, a photo by markasky on Flickr. 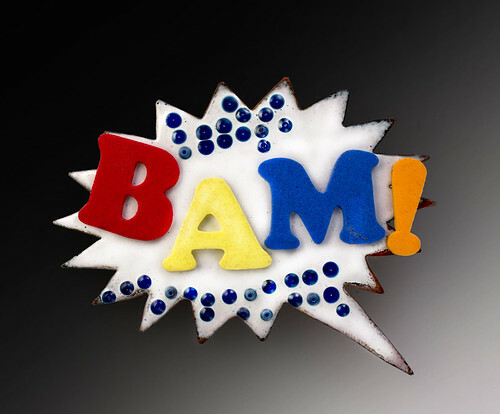 Brooch A Day combined with Etsy Metal Monthly Theme - Pop Art. A combination of Andy Warhol, Roy Lichtenstein, and Batman. Copper, vitreous enamel (torch-fired), glass beads, rubber stick-on letters. BAD 2013 24/365, a photo by markasky on Flickr. 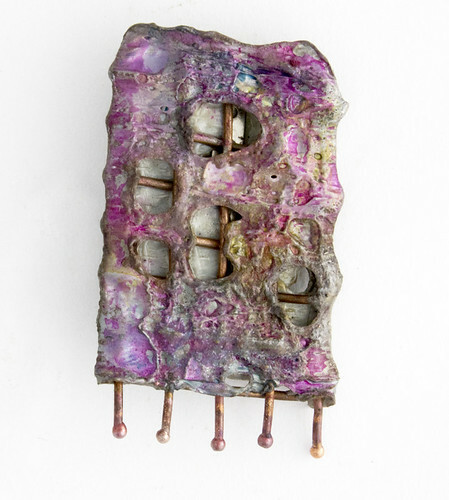 Another brooch closer to 2014!